A visual overview of the iconic company. IBM (NYSE:IBM) is generally known as a slow-growth tech stock that provides a solid dividend but weak share price growth. To better understand Big Blue, here are six charts detailing the inner workings of its business. 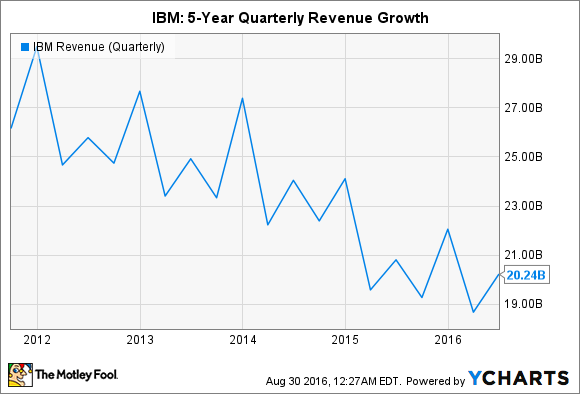 IBM's biggest problem is its lack of top line growth. Sales fell 3% annually last quarter, marking the company's 17th consecutive quarter of year-over-year declines due to weak enterprise spending, currency headwinds, and tough competition in the IT, software, and hardware markets. Under CEO Ginni Rometty, who took the company reins in 2012, IBM divested units that generated low-margin revenue, including consumer PCs, low-end servers, and its chip foundry, and acquired higher-growth businesses in the cloud, AI, mobile, social, and security markets. Image source: IBM investor presentation (aaS = as a service). Over the past 12 months, those five businesses generated $31 billion in revenue and accounted for 38% of the top line. However, its "cloud as a service" annual run rate of $6.7 billion still trails far behind that of market leader Amazon, which posted an annual run rate of $11.5 billion for its cloud platform, Amazon Web Services (AWS), last quarter. While progress with the strategic imperatives looks encouraging, those five businesses are actually woven into IBM's other business units. This means that their growth looks a lot less impressive when we consider how these overall units are faring. Data source: IBM investor presentation (YOY = year-over-year). This chart indicates that while revenue from strategic imperatives rose across all of the business units except for Systems, only the Cognitive Solutions unit (which includes the AI platform Watson) broke into positive territory overall. That's why IBM closed or announced the closure of ten different acquisitions to accelerate the growth of its strategic imperatives this year. That said, sales growth is unlikely to return to positive territory anytime soon. Analysts currently expect the company's sales to dip 2.6% this year and another 0.4% next year. Over the past two years, Rometty greatly reduced IBM's dependence on buybacks to inflate earnings without sales growth -- an unsustainable strategy her predecessor Sam Palmisano relied on. Previously, buybacks were funded by a combination of free cash flow and low-interest debt, so reducing them freed up more cash for investments, acquisitions, and dividends. 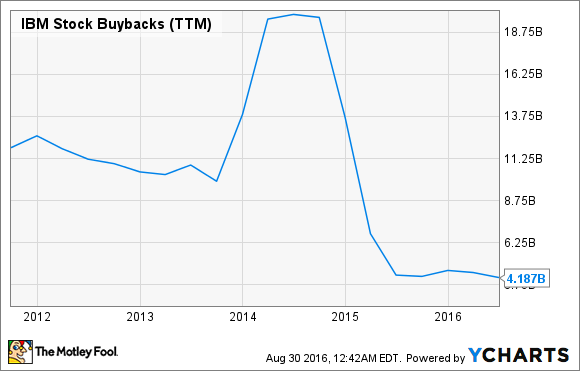 It would also be logical to stop funding buybacks with debt as interest rates rise. 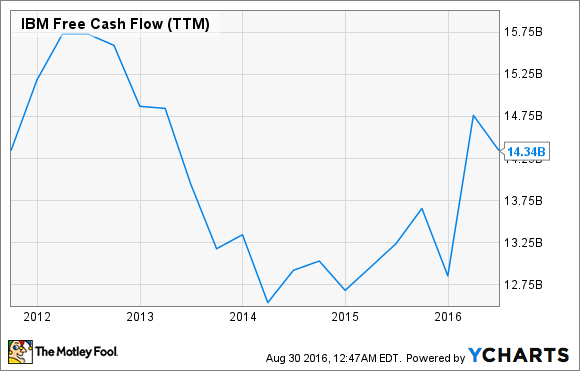 If we look back at IBM's free cash flow growth over the past five years, we can see the positive impact of reduced share repurchases. Over the past 12 months, IBM spent just 36% of its free cash flow on dividends, which gives it plenty of room to continue its 16 straight years of annual dividend hikes. IBM currently pays a forward yield of 3.5%. That's higher than the yield of other "mature" tech plays like Microsoft and Intel, which respectively pay forward yields of 2.5% and 2.9%. Rometty frequently refers to IBM's divested businesses as "empty calories" which produced revenue without profits. However, the strategic imperatives aren't really high-margin businesses either. Fierce competition has greatly reduced prices across the cloud and mobile markets. IBM's position as the underdog also doesn't give it the pricing power of bigger platforms such as AWS or Microsoft Azure. 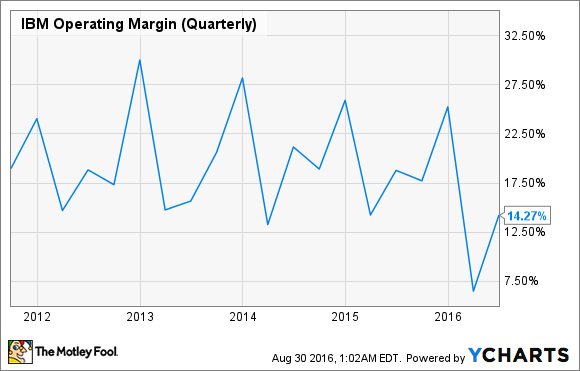 As a result, operating margins at IBM have gradually declined over the past two years. That decline has weakened its earnings per share, which fell 27% annually last quarter with less support from share buybacks. Analysts expect IBM's earnings to fall 9.5% this year but potentially rebound 4.4% in 2017. IBM is still a company in transition. Its strategic imperatives are growing as a percentage of its top line, but their margins are questionable, and they continue to be weighed down by the company's legacy businesses. While the decision to reduce buybacks was wise, it also means that earnings growth will look ugly for the foreseeable future. All in all, IBM is a solid dividend stock with a fairly attractive valuation of less than 12 times full-year 2016 earnings, but I don't see it rallying anytime soon.